Fractures of the metacarpals are generally due to direct trauma and may be associated with other osseous injuries. The Bennett, Rolando, and boxer's fractures are specific types of metacarpal injuries. A PA radiograph of the hand. This demonstrates a comminuted fracture of the base of the fifth metacarpal. B PA radiograph of the hand. This details the appearance of an oblique fracture of the third metacarpal. C PA radiograph of the hand. 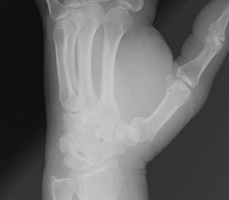 This shows fractures of both the third and fourth metacarpals as well as a Colles fracture. D PA radiograph of a fracture of the second metacarpal. E Oblique radiograph of the wrist. This demonstrates a fracture of the proximal aspect of the first metacarpal. It does not involve the articular surface, distinguishing this fracture from the Bennett and Rolando fracture.